Honor, the subsidiary of Huawei has finally launched its latest flagship, the Honor 7 smartphone in India today. It was launched in China earlier this year for a price of CNY 1,999 and is recently also made available in Europe for £249 (€340). In China, the device had been launched in three different storage variants, while in India the device will be available only in 16GB variant. The device tout the stylish aluminum alloy exterior which gives premium feel. Talking about the display, it sports a 5.2-inch Full HD display, having a pixel density of 423ppi. These models run on company’s in-house chipset, the 64-bit Kirin 935 chipset while clocking the speed at 2.2 GHz for quartet Cortex A53 cores, and 1.5 GHz for other four set of cores. This is a big.LITTLE configuration and ARM’s Mali-T628 GPU doing the lifting for graphics. The Honor 7 pack 3GB of RAM and 16-64GB internal storage, plus leaving room for expansion via microSD card slot. The device housed inside a metal chassis with a resulting thickness of 8.5mm, thereby weighing 157g. 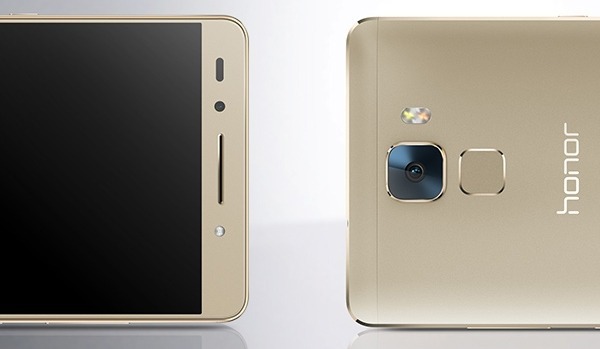 The most interesting spec about this device is the upgrade of 20MP rear camera. It features a phase detection technology to enhance the quality capture, as it boasts the fast Auto Focus. It likely means that the company has used the new Sony sensor with f/2.0 aperture 6-lens module and sapphire glass for added protection. While the front facing camera on the Honor 7 is of 8MP, Sporting a wide-angle lens, the front camera on Huawei’s latest Honor device is something of a marvel. Talking more about the interesting features, the company have also added a fingerprint scanner on the back of the device. The scanner is placed just below the rear camera module, which reminisce the placement of Mate 7 from the Ascend phablet series. The device would be coming with series of connectivity features like NFC, Wi-Fi 8 02.11a/b/g/n/ac, Bluetooth 4.1, and with region-specific LTE radio bands. All that hefty hardware is backed by a 3100mAh powerful battery pack, which also offers quick charging support. So, juicing up the device from zero to hundred would take less than 1 and a half hour, or you could get 50% charge in half an hour. Quite interesting, right! Moreover, the device would be coming up with latest Android OS, the Lollipop 5.0 covered with Huawei’s EMUI 3.1 version. You might think all this is too much and would easily cost you a hefty amount because why not. But with an aggressive price tag of Rs.22,999 for the base model, you could have this device in your pockets.